Sudan, the last male white rhino. © Ol Pejeta Conservancy. It is with great sadness that Ol Pejeta Conservancy and the Dvůr Králové Zoo announce that Sudan, the world’s last male northern white rhino, age 45, died at Ol Pejeta Conservancy in Kenya on March 19th, 2018. Sudan was being treated for age-related complications that led to degenerative changes in muscles and bones combined with extensive skin wounds. His condition worsened significantly in the last 24 hours; he was unable to stand up and was suffering a great deal. 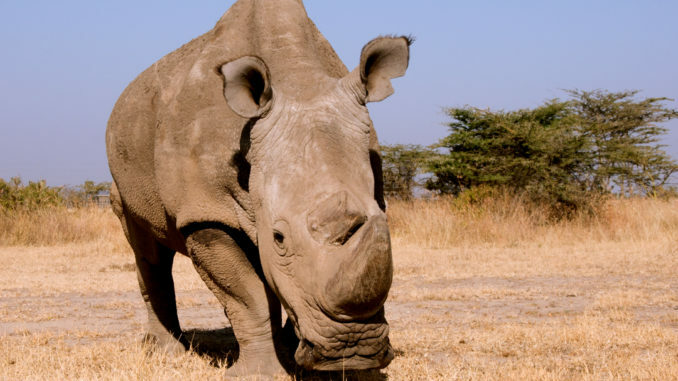 The veterinary team from the Dvůr Králové Zoo, Ol Pejeta and Kenya Wildlife Service made the decision to euthanize him.